Last year, Techlicious reported on a cool new feature baked into the Google Chrome mobile browser that intelligently reduces the amount of data used when surfing the web. Now, that useful feature is coming to the desktop version of Chrome 41 and newer in the form of a new browser extension add-on called Data Saver. When you attempt to visit a website in a version of Chrome equipped with the new Data Saver (beta) extension, your page request is routed through Google’s Data Compression Proxy server. It reviews the bandwidth-heavy elements of the site to compress and optimize its files before relaying the content to your browser. There are a few limitations though – for security and privacy reasons, Data Saver is turned off by default when you attempt to visit a secure site via HTTPs or surf the net using an Incognito tab. Otherwise, Data Saver can shave up to 50% off your bandwidth usage without negatively impacting your web experience. Obviously, Data Saver is a godsend for those of us who are subject to nasty broadband data caps from our ISPs. It’s also good for those with slower connections, too – less data to download means faster downloads. 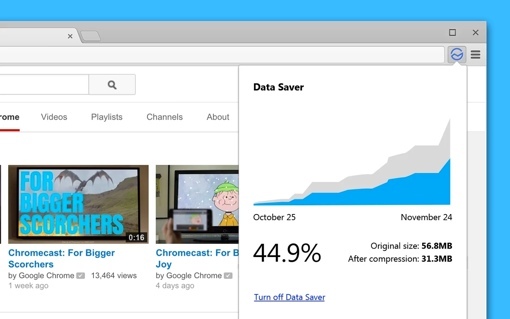 You can download the beta version of the Chrome Data Saver browser extension by visiting its page on the Chrome Web Store and following the on-screen prompts. Note that you’ll need to manually turn the feature on after downloading and installing the extension. You can activate Chrome’s data saving feature on your Android mobile device by visiting “Settings” > “Bandwidth Management” > “Reduce data usage” and switching the toggle to “on.” Data Saver is also available as a feature in Chrome for Apple iOS.